The Virginia Creeper Trail is open to hiking, jogging, mountain biking, and horseback riding. The former rail bed passes through the beautiful back country of Southwest Virginia. Forty seven trestles and bridges provide scenic views of the region's creeks, farmland, and mountain forests. The Virginia Creeper Trail is rich in beauty and regional history. From the trail head right in the historic district of Abingdon, VA, it stretches 35 miles through the trail town of Damascus, VA, and up to the North Carolina State Line near Whitetop, VA.
Bike rentals and shuttle arrangements can be made at the the Virginia Creeper Trail Bike Shop. Adventures that will leave long lasting memories for your friends and family await. Following the route of an old railroad bed, the Virginia Creeper Trail is named for the steam engine that once chugged along it and for the Virginia Creeper vine that populates the area. With the abandonment of many railroads in the 1970s, a national movement gained momentum to convert train tracks into trails. A coalition of local citizens, government and the US Forest Service banded together to acquire the old railroad right-of-way, and thus the Creeper Trail was born in 1987. The 34-mile multi-use trail begins in Abingdon, a popular access point at Mile 0, and then carries on through rolling farmland to Damascus at Mile 15.5. From there, the Virginia Creeper winds up to its highest point at Whitetop Station, offering plenty of amenities and activities along the way. Visitors can make their time on the trail as leisurely or as strenuous as they please, spending anywhere from a few relaxing hours to several exploratory days in the area. 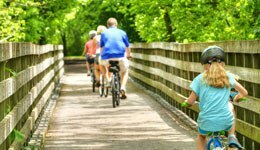 The Virginia Creeper Trail is a dream come true for anyone who wants to become immersed in the beautiful scenery of the Southwest Virginia and get a firsthand look at its unique history and landscapes. The trail winds its way through airy forests alongside the bubbling Beaver Dam Creek, with opportunities to stop and explore quaint towns and historic buildings. Cruising down the Virginia Creeper Trail on a bicycle is a unique way to experience the mountains of Virginia, and cycling is the perfect medium between hiking and driving, allowing you to cover a lot of ground while still being intertwined with your surroundings. While technically considered a mountain biking trail, the Virginia Creeper is well-maintained and consists mostly of crushed stone, so it can be easily navigated on a hybrid or road bike. The most popular way to complete the trail is to take a shuttle from Damascus or Abingdon to Whitetop Station, the highest point on the the Virginia Creeper. From there, visitors can bike 17 miles down to Damascus to be picked up. The gentle downward slope on this section of the well-marked trail makes it a breeze for even the most inexperienced cyclists. Along the way, visitors can stop to enjoy panoramic views of the rolling mountains, cool off in the creek. and even break for snacks and restrooms. (There are no facilities actually on the trail, but there are 11 access points to towns, forest service centers, water and toilets.) The 47 trestle bridges on the path provide a bird’s-eye view of the forest floor and eliminate the ups and downs as the route navigates the hilly terrain. Beyond Damascus, the trail continues another 17 miles to Abingdon, a charming little town with lots to see and do. While most people complete the trail in this relaxed way, those looking for a challenge can opt to climb the 1,600 feet up to Whitetop Station, either on foot or on two wheels. Anyone looking to see spectacular scenery and cover a lot of ground with minimal effort, especially families seeking an outdoor activity that everyone can enjoy. With options to make this trail extremely easy or very difficult, anyone can find their perfect activity and have a great time on the Virginia Creeper Trail. For families and people with less mobility, the 17-mile ride from Whitetop to Damascus is a gentle downward slope that everyone can complete. Even inexperienced cyclists can ride the trail’s full 34 miles in one day. Those looking for a more serious day on the Creeper Trail can reverse the route and climb all the way to Whitetop Station. While it’s primarily a biking trail, it’s also a popular destination for hiking, fishing, birdwatching, and horseback riding. The trail has access points in Whitetop, Alvarado, Damascus, Creek Junction, and Abingdon. Many people choose to take a shuttle from Damascus or Abingdon up to Whitetop Station, the highest point on the trail. From there, you can ride the 17 miles to Damascus to be picked up, or all the way into Abingdon. In any of these towns, the trail is signed and easy to locate. Fees/Permits FalseAccess to the trail is free, but most people choose to pay for a shuttle service so as to only ride the trail in one direction.